We had a sneak peak at Zara's Spring-Summer 2013 collection and we can't wait for the range to land in every store. The famous low cost brand has once again succeeded in offering quality and skilfully tailored clothing at affordable prices, which also follow the main fashion trends. The new collection is perfectly in-style with the directions of the latest runways shows, very classy, fresh and characterised by light materials. The range offers plenty of informal garments, which can be mix and matched to achieve a stylish personal look to be worn on every occasion. The star of this amazing Eighties-inspired new collection is the oversized jacket with padded shoulders, which Zara proposes revisited in a wide choice of colours, styles and fabrics. There are also elegant blazers and jumpers with cute balloon sleeves. Zara's Spring-Summer 2013 collection focuses on bold colours, monochrome patterns, contemporary prints and embellished clothing and accessories. A new irresistible trend for every fashion victim is the casual oversized suit worn with shorts instead of trousers, which will be a must look for the office. The same stylistic language has been recently seen in Paris on Marc Jacobs' Louis Vuitton runway show. Cropped pencil trousers are here to stay and will be with us for another season, as well as mini and pencil skirts, reinterpreted peplum dresses and tops and embroidered bikers jackets. Zara also plays with textures and combines lightweight materials, heavy embellished fabrics, lace, jacquard and tweed to stripes, checks and animal prints. 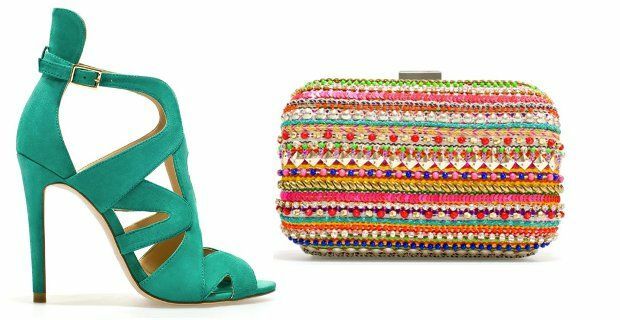 The collection boasts a variety of statement accessories, such as bright suede sandals and beaded bags.